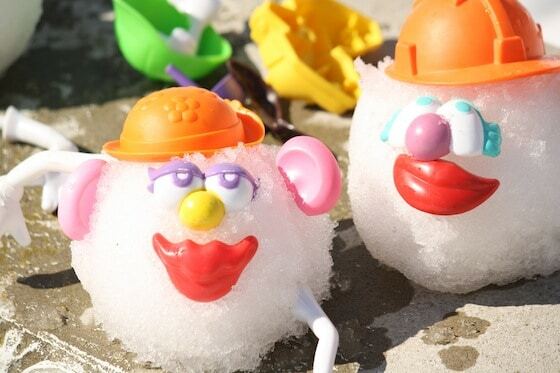 Building a snowman is always a favourite winter activity among kids, and we usually do it the same old way: roll three balls, plunk a hat on top, pop on some eyes and a mouth, and done. 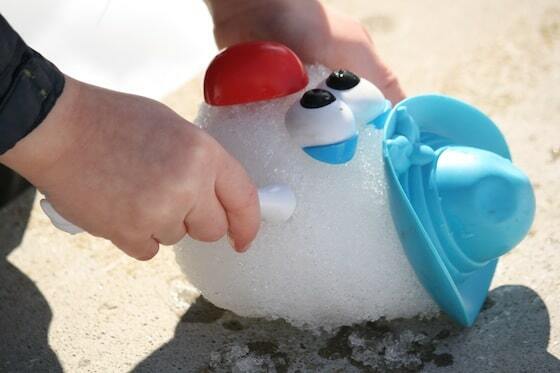 Well, if you’re looking for a fun, new way to build a snowman this year, here’s a cute idea. 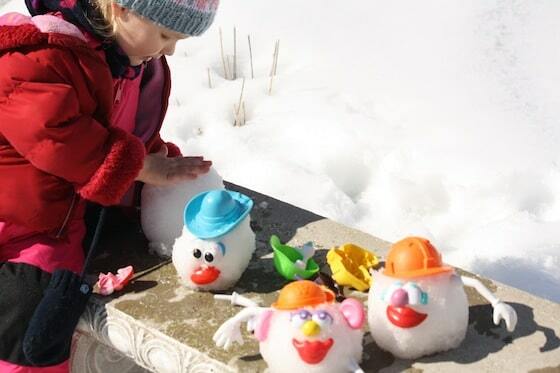 We built a whole family of Potato Head Snowmen in the backyard this morning! The sun was really strong, and the snow was too soft and slushy to build a big snowman like the hooligans were asking for, so I brainstormed for a minute to see if I could come up with and new snowman ideas that might work with the weather we were having. I’m happy to say that I found one that worked VERY well! 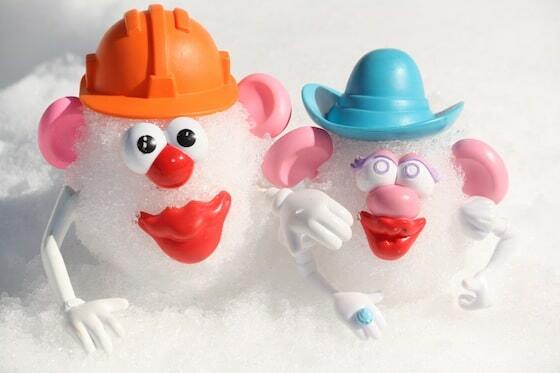 Potato Heads in the snow! 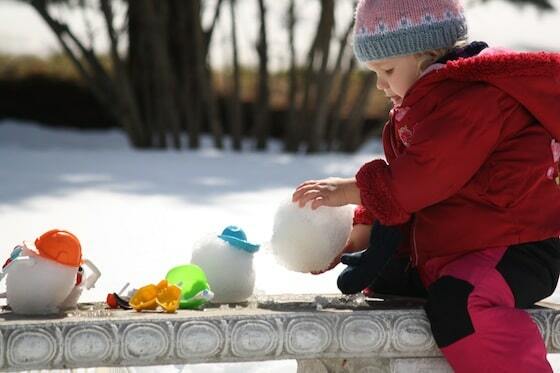 This turned out to be a terrific alternative to building a big snowman. It’s perfect for when the weather’s not co-operating, or if you’re just looking for a fun activity that your kids can do in the snow. 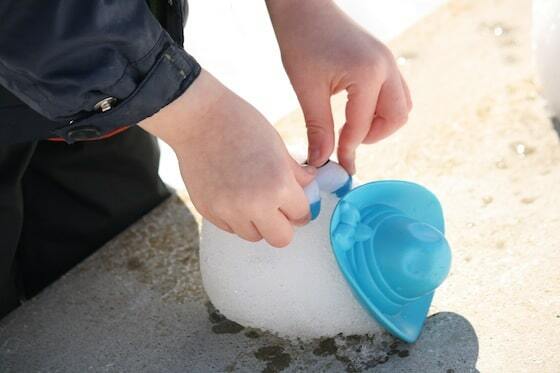 You could even fill a basin with snow and it would be a great indoor snow activity for those days when it’s too cold to get outside. 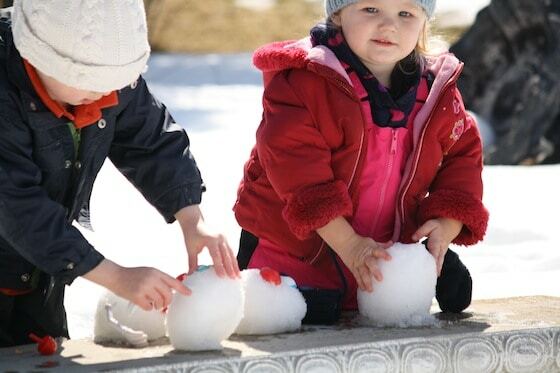 On this day, our snow was too wet to make anything larger than the snowballs you see here, but you can bet we’ll be trying this snowman idea on a larger scale when the temperatures are cooler. What an easy way to make a snowman face if you don’t have buttons and a carrot handy! I love that this combines two favourite kids’ activities into one. Building Snowmen and Mr. Potato Heads. Gotta love putting a new spin on an old favourite. Oh my goodness! How do you come up with all these adorable play ideas?? You hooligans are so lucky to have you for their momma! These look so FUN!!!! I sure wish we had snow. I did the paper plate bird today with my kids. All three of them liked the craft. 🙂 They turned out really cute! Brilliant, I am hitting the charity shops tomorrow I shall be looking for some mr potato heads! Love this – fab idea! Just thought, no snow? Mud! You bet! I already have it planned, Geoff! Thanks, Kristina! Hopefully you have a little snow where you are, and you can give it a try! 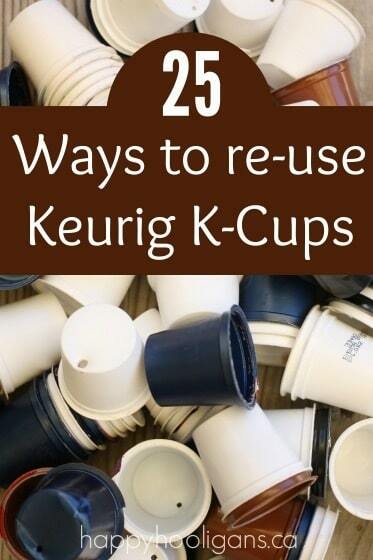 I never thought of this — great idea! Oh my word, this makes me smile! I LOOOOVE this idea, and I’m going to pin it for next winter (as I think we’re done with snow now). Thanks for sharing! 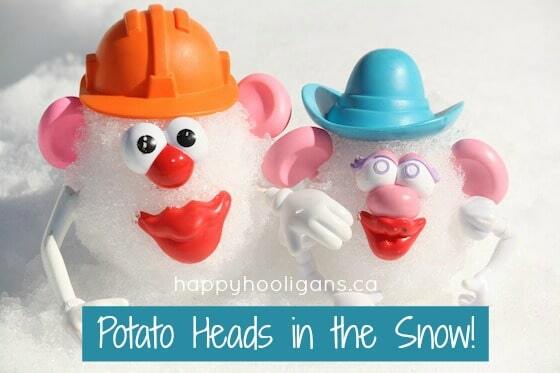 Love this Jackie, so cute & your snow looks perfect for making potato heads! Thanks so much for joining in the latest outdoor play party. So so cute! 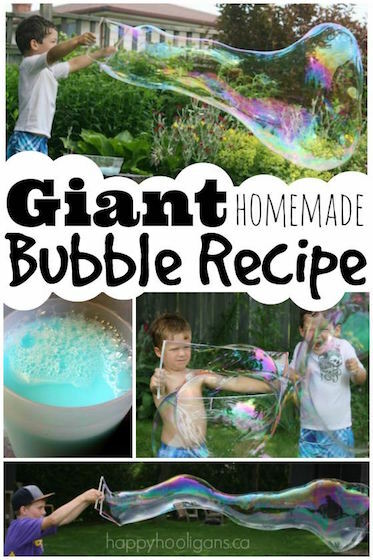 Can’t wait to do this one with my boys – and maybe even with my preschoolers at work! 🙂 Thanks for the inspiration! Oh my goodness, I love this! What a fun way to get our Potato Head stuff back in use! Pinning and trying this with them today! Great idea, sharing on our Facebook page! I just stumble upon this post — and absolutely love it!!! What a creative idea. I’m pinning it so that I can do it with my grandkids.